Podiatrist Dr. Mary Carlson was chosen as the honoree for District Thirteen of the Nassau County Legislature 17th Annual Women’s History Awards Ceremony. Mineola, NY - March 20, 2015 - Podiatrist Dr. Mary Carlson was chosen as the honoree for District Thirteen of the Nassau County Legislature 17th Annual Women’s History Awards Ceremony. In an awards ceremony held on March 16th in Mineola, Dr. Mary Carlson DPM was honored during the legislature’s “Women: Trailblazers In The New Millennium” ceremony. Dr. Mary Carlson is the founder of Shoes For All, a non-profit organization dedicated to collecting and distributing new and gently worn shoes for individuals in need in the community. She also runs a successful podiatry practice on Willis Ave. in Williston Park. “I am so honored to be recognized as a trailblazing woman here in Nassau County. March is National Women’s History Month and I think it’s great that the county legislature takes steps to recognize the works done in our community by women. This is a tremendous honor” Said Dr. Carlson. 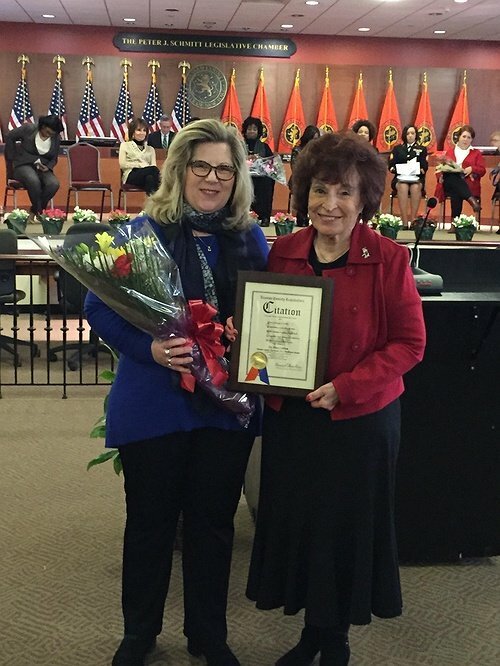 Dr. Carlson, only the 17th woman to receive this honor, was presented with her award on March 16th by the Honorable Norma L. Gonsalves of District Thirteen of the Nassau County Legislature. More information about Dr. Mary Carlson can be found on her website or by calling 516-248-8188. More Information about Shoes For All can be found at www.ShoesForAll-SFA.com. Subject: LongIsland.com - Your Name sent you Article details of "Dr. Mary Carlson Honored By Nassau County Legislator Gonsalves"